The 47th FLOW CARIFTA Games is set for the Easter holiday weekend, from March 30 to April 2, 2018 at the Thomas A. Robinson National Stadium in Nassau, The Bahamas. During the meet, Ms Dominique Maloney was the lucky raffle winner of a Samsung G5 Prime mobile phone with $100 credit compliments of Digicel; proceeds from the raffle benefited the Fast Lane Track Club founded by Coach Dag Samuels. 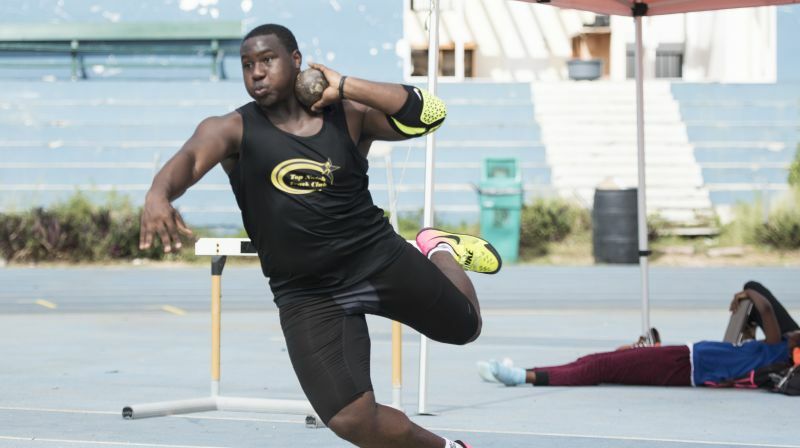 The next meet of the Dag Samuels Developmental Series is slated for Saturday February 10, 2018 at the A.O. Shirley Recreation Grounds on Tortola. Overseas based Virgin Islands athletes were also in competition at the weekend, although indoors. Akeem Bradshaw competed in the triple jump with a jump of 49.2m to set a meet record at the Hawkeye Invitational. Trent Herbert ran a time of 6.91seconds in the Boys 55m dash (personal best 6.84s), 18-09.50 in the boys long jump (personal best 19-10.50) and 38.00s in the 300m Dash ( personal best 37.59s) at the MIAA/IAAM Championships. And Khari Herbert won the 400m finals with a time of 48.46s with a track record on a 200m flat track at the Finn Pincus Invitational in Virginia. GIRLS U13 (6.6lbs): 1. Savianna Joseph (FLTC), 6.03m. U15 (6.6lbs): 1. Jonique Smith (ATC), 7.69m. 2. Alexa Hodge (ATC), 7.57m. 3. Alli-anna Davis (STTC), 6.79m. 4. 3. Palesa Caesar (ATC), 6.04. U20 (8.8lbs): 1. Akira Phillip (ATC), 8.82m. BOYS: U15 (12lbs): 1. Sh’ael Lavacia (STTC), 10.98m. 2. Orlando Douglas (ATC), 7.43m. 2. Mehki Smith (FLTC), 6.72. U20 (14lbs): 1. Diamante Gumbs (TNTC), 15.56. 2. Djimon Gumbs (TNTC), 14.34. 3. Deshoy Ward (ATC), 10.92. OPEN MALES (16lbs): 1. Kevin Vanterpool (TNTC), 9.51m. GIRLS U13: 1. Savianna Joseph (FLTC), 13.96m. U15: 1. Jonique Smith (ATC), 19.52m. 2. Alexa Hodge (ATC), 16.71m. 3. Alli-anna Davis (STTC), 15.10m. 4. Palesa Caesar (ATC), 10.94. U20: 1. Akira Phillip (ATC), 25.27m. BOYS: U15 (1.5kg): 1. Sh’ael Lavacia (STTC), 38.64m. 2. Orlando Douglas (ATC), 33.47m. 2. Mehki Smith (FLTC), 16.35. U20 (1.75kg): 1. Djimon Gumbs (TNTC), 52.73. 2. Diamante Gumbs (TNTC), 48.28. 3. Deshoy Ward (ATC), 32.19. OPEN MALES (2 kilos): 1. Kevin Vanterpool (TNTC), 38.64m. OPEN Females: 1. Katrina Lindsay, (FLTC), 1:43.84. 2. Tashira Edwards (STTC), 1:44:57 3. Arianna Hayde, (STTC),1:53.81. BOYS: U15: 1. Kendi Brewley (TNTC), 1:31.91. 2. Jelani Croal (STTC), 1:33:72 3. Rashaun Jack, (STTC) 1:55.97. GIRLS: U9: 1. Nickyjah Brewley (FLTC Jrs. ), 10:76. 2. Tiffany Herbert (TNTC), 10:97. U11 Girls: 1. Tamri Thomas (TNTC), 9.55. 2. Taryn Augustine (TNTC), 9:98. 3. Hailey McMaster (UNA), 10:30. 4. Ka’Brina Hull, (STTC), 10.55. 5. Malia Robin (STTC), 10:69. U13 Girls: 1. Acaida Frett, (FLTC), 8.78. 2. Vinesha John, (FLTC), 9.03. 3. Tiya Herbert, (TNTC), 9.28. 4. Jah’Kyla Morton, (FLTC Jrs), 9.50. 5. Nejma Robinson, (FLTC), 9.75. U15 Girls (Heat 1): 1. Jahtivya Williams, (STTC), 7:93. 2. Amia Todman, (STTC), 7:97. 3. Kailia Martin, (FLTC), 8:03. 4. Tenisha Herbert, (FLTC), 8.18. 5. Nickelia Drummond, (STTC), 8:34. 6. Abriel Magloire, (FLTC), 8:44. 7. Crystal Maximea ,(FLTC), 8:58 8. Deonna Campbell, (STTC), 8.70. 9. Anaya Frett, (FLTC), 9.50. BOYS U9. 1. B’Jhoni Roberts, (FLTC Jrs. ), 10.22. 2. Re’Jean Campbell, (STTC), 10.76. U13: 1. Kaleen Lettsome, (STTC), 8.88. 2. Cayden Maximea, (FLTC), 9.78. U15: 1.Khybah Dawson, (TNTC), 7.56 2. Jamoi Roberts (STTC), 7.91. U20. Troy Barzey (STTC), 7.26. U13: 1. Acaida Frett, (FLTC), 50.02. 2. Kenniqua Grate, (STTC), 53.43. 3. Nejma Robinson, (FLTC), 53.87. U15: 1. Jahtivya Williams, (STTC), 42.61. 2. Akeela McMaster, (UNA), 43.11. 2. Kaelyaah Liburd, (RSTC), 43.40. 4. Kenyatta Grate, (STTC), 44.50. 5. Nickelia Drummond, (STTC), 44.82. 6. Tenisha Herbert (STTC), 46.15 7. Lia Claxton, (STTC), 47.28. 8. Kailia Martin, (FLTC), 46.82. 9. Anaya Frett, (FLTC), 57.03. U17: 1. Alisha Hayde (STTC), 43.97. 2. Linessa Caesar, (FLTC), 53.40. OPEN FEMALES: 1. Beyonce DeFreitas, (STTC), 37.97. 2. Akrisa Eristee, (STTC), 39.33. 3. Zara Brown, (STTC), 40.72. 4. Tashira Edwards, (STTC), 42.69. 5. Kelsha Fortune, (TNTC), 42.97. 6. Deya Erickson, (STTC), 44.50. BOYS: U11: 1. Tiondre Frett (STTC), 48.31. 2. Othniel Gillings (FLTC Jrs), 51.38. 3. Brian Roberts, (FLTC Jrs), 1:02.81. 4. Braeden Martin (FLTC Jrs), 1:03.66. U13: 1. Antuwn Maduro, (STTC), 45.71. 2. Sean Samuel, (RSTC), 49.56. 3. Cayden Maximea (FLTC Jrs. ), 51.39. U15: 1. Khybah Dawson (TNTC), 39.90. 2. Santos Caines, (STTC), 44.03. 3. Rashaun Jack, (STTC), 48.00. U17: 1. Jaleel Croal, (STTC), 35.53. 2. Malik John, (STTC), 37.06. 3. Jmari Duhaney, (STTC), 37.61. 4. Wanyae Belle, (STTC), 40.64. U20 Boys: 1. Ke’Andrae Campbell, (TTC), 35.84. 2. Troy Barzey, (STTC), 36.36. 3. Alonzo Baptise, (TNTC), 41.56. 3. 300m HURDLES: OPEN MALES: 1. Gevon Smith, (STTC), 44.07 2. Jonathan Hing (STTC), 48.02. 1000M: U20 Girls: Mariah Christian, (RSTC), 3:25.44. U20 Boys: Samuel Romney, (STTC), 2:56.19. U11: 1. Tamir Thomas, (TNTC), 23.31. 2. Shyra Stoutt, (STTC), 24.13. 3. Taryn Augustine, (TNTC), 24.31. 4. Ka’Brina Hull, (STTC), 25.59. 5. Hailey McMaster (UNA) 29.94. 6. Malia Robin, (STTC), 26.87. U13: 1. Jah’Kyla Morton, (FLTC Jrs), 21.48. 2. Vinesha John, (FLTC), 21.80. 3. Tiya Herbert, (TNTC), 23.03. U15: 1. Jahtivya Willliams, (STTC), 19.00. 2. Amia Todman, (STTC), 19.28 3. Nickelia Drummond (STTC), 19.75. 4. Abriel Magloire (FLTC), 19.90. 5. Kenyatta Grate, (STTC), 20.16. 7. Tenisha Herbert (STTC), 20.40. 8. Lia Claxton (STTC), 20.53. 9. Crystal Maximea, (FLTC), 20.70. 10. Kailia Martin (FLTC), 20.75. 11. Deonna Cambell (STTC), 21.88. 12. Carleen Lenton (STTC), 25.66. U17: 1. Breisly Rabsatt (STTC), 20.59. OPEN Females: 1. Beyonce DeFreitas (STTC), 16.81. 2. Zara Brown (FLTC), 17.84. 3. Akrisa Eristee (STTTC), 18.06. 4. Deya Erickson (STTC), 18.81. 5. Arianna Hayde (STTC), 19.31. 6. Katrina Lindsay, 19.73. 7. Shanice Hucey (STTC), 20.34. U11: 1. Tiondre Frett, (STTC), 20.79. 2. Latriel Williams, (STTC), 21.83. 3. Othniel Gillings, (FLTC Jrs), 22.00. 4. Clariq Frett, (FLTC Jrs), 22.69. 5. Brian Roberts Jr, (FLTC Jr), 23.72. 6. Azriel Smith, (STTC), 24.47. 7. Braeden Martin, (FLTC Jrs), 28.19. U13: 1. Antuwn Maduro, (STTC), 20.15. 2. Kaleem Lettsome, (STTC), 20.58. U15: 1. Kendi Brewley (TNTC), 18.58. 2. Jelani Croal (STTC), 19.22. 3. Rashaun Jack (STTC), 19.97. 4. Hugh-Anthony Jones (TNTC), 20.28. 5. Daniel Maduro (FLTC), 20.89. U17: 1. Jaleel Croal (STTC), 16.12. 2. Malik John (STTC), 17.16. 3. Jmari Duhaney (STTC), 17.66. 4. Wanyae Belle (STTC), 18.12. 5. Kymani Percival (FLTC), 20.34. OPEN MALES: 1. Johnt’a (FLTC), 16.02. 2. Joshua Lynch (STTC), 16.94. Action speaks! Go Djimon !!! !